This is a story about how one mom’s very personal experience became a spark inside of her to act. That spark has now turned into a movement. Last year, Danialle Karmanos’ son Leonidas had emergency surgery at Children’s Hospital in Detroit. She slept on chair in his room the entire time. During her time at the hospital waiting for her son’s recovery, she often wandered around the hallways— noticing how many kids (and infants) were alone, without the love and companionship of family. She couldn’t fathom a mother or father not being at their child’s side during a hospital visit and began asking questions. She learned the sad reality that in many hospitals, children are often alone. The reasons are just as many as they are diverse. Many of these infants come from broken homes or the parents are living in challenging circumstances. The mother of four young boys knew the power of the human touch. “Early contact leads to improved neurodevelopment, higher IQ, and lower rates of aggression,” Danialle said, explaining why something as simple as cuddling an infant is so important. Ever the entrepreneur and philanthropist, Danialle sprung to action. She contacted Luanne Ewald, the CEO of Children’s Hospital and asked if it would be ok if she and some of her friends could visit the hospital periodically and spend time with kids who were alone. An enthusiastic “yes,” followed and a new movement called The Cuddlers was born. The organization’s goal is so simple— yet so profound. The Cuddlers was founded to meet the needs of human touch of these infants who are left alone for hours and days at a time in hospitals throughout the region. This week, Danialle and a team of her cuddler volunteers visited Children’s Hospital to do some cuddling. They spent hours holding and rocking infants and children– including a baby who was back in the hospital for the third time in her young life, suffering from a rare virus that prevented actual physical contact. 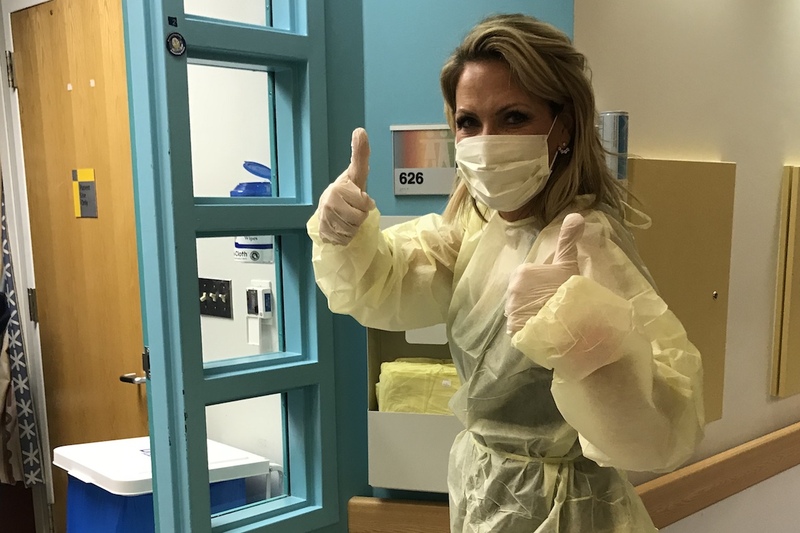 That didn’t stop Danialle, who donned scrubs, gloves and a mask. She wanted that child to feel that someone was holding her. “We got this,” Danialle told her volunteers. It seems the volunteer work had a double impact— on the kids, as well as the volunteers themselves. “The healing power of touch is well documented but I didn’t anticipate the impact on us. My heart is overflowing. 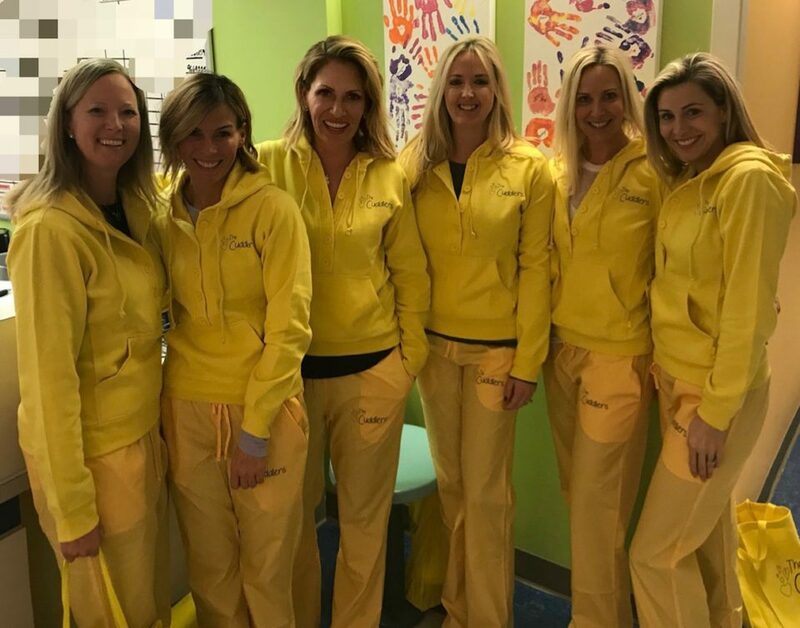 Not to mention our complete admiration for the amazing hospital staff and volunteers,” Danialle said in a Facebook post. It was also an educational experience. “One thing I learned yesterday was how many parents want to be there but can’t because of their circumstances. Many have to work because without work they won’t have insurance. It’s a heart breaking choice they have to make,” Danialle said. For those moms, for those families, The Cuddlers are here for you, Danialle said.